A big question: is Alibaba.com overvalued or Yahoo is seriously undervalued? Let’s put it that way Alibaba lost $13B from its market cap in just one month, yet the company’s market value is close to 50% from what Yahoo!’s current value is! When Alibaba went public on the Honk Hong Stock Exchange a couple of months ago everything was more than perfect and the company has raised from the public sector the whopping amount of $1.49 Billion. Alibaba’s market capitalization then skyrocketed to the $25.7B range, just not too far from what Yahoo!’s market capitalization looked like by the time of the IPO of the Chinese Internet company. All those numbers made it the largest Internet IPO in Asia and the second largest globally. Yahoo! was then happy too. Shares of Alibaba.com, the Chinese B2B marketplace, nearly tripled in their Hong Kong debut, closing at HK$39.50 (US$5.09), after its IPO priced at HK $13.50 (US$1.74). The steep rise was easy to see coming, considering the groundswell of enthusiasm for the company preceding the IPO. The company quickly reached a $25.7 billion market cap, which brings it close with Yahoo (NSDQ: YHOO) Japan as the largest internet company in Asia, according to online sources. Alibaba.com and its parent company Alibaba Group initially offered a total of 858,901,000 shares under the Global Offering, of which 227,356,500 shares were offered by the Company and 631,544,500 shares were offered by Alibaba Group. An additional 113,678,000 shares were sold by Alibaba Group upon exercise by the International Underwriters of their Over-Allotment Option. The eight Cornerstone Investors which participated in the Global Offering included Yahoo! Inc., AIG Global Investment Corporation (Asia) Limited, Foxconn (Far East) Limited, Industrial and Commercial Bank of China (Asia) Limited, Cisco Systems International B.V., and entities affiliated with Mr. Peter Kwong Ching Woo (Chairman of The Wharf (Holdings) Limited), the Kwok family (controlling shareholders of Sun Hung Kai Properties Limited) and Mr. Kuok Hock Nien. The total cornerstone investment was HK$2.1 billion (US$274 million) and all Cornerstone Investors agreed to a lock-up period of 24 months from the date of listing. Goldman Sachs (Asia) L.L.C. and Morgan Stanley Asia Limited were the Joint Global Coordinators and Joint Sponsors, and with Deutsche Bank AG, Hong Kong Branch, Joint Bookrunners and Joint Lead Managers of the Global Offering while N M Rothschild & Sons (Hong Kong) Limited was the Financial Advisor to the Company. Let’s take a look at how the things looked like for the US Internet giant by that time. Yahoo! is known to own 39% in Alibaba Group. Alibaba Group holds a 75% stake in Alibaba.com, which was worth $17.4 billion. Yahoo owns 39% of Alibaba Group, which puts the value of their share at $6.8 billion. Yahoo! has also bought around 1.2% stake in Alibaba.com by paying $100M so the direct-owned 1.2% stake was worth about $278 million. That puts the total value of Yahoo’s interest in Alibaba.com at north of $7 billion. That’s about 16.7% of Yahoo’s then $42 billion valuation. What happened next? A few days after the IPO things appeared to be worsening. Many investors took the money and ran, driving shares of Alibaba.com Ltd. down 17% a day after their debut, when they nearly tripled from their initial-public-offering price. Analysts said the flagship business-to-business unit of Alibaba Group is likely to fall further on continued profit-taking for a while, as the stock is still overvalued. The shares of Alibaba.com then fell to 32.60 Hong Kong dollars (US$4.20) from almost 41.50HKD. Aside the fears of the investors that the stock price was unsustainable the company’s stock was also hit by Yahoo!’s CEO Jerry Yang’s appearance on Capitol Hill, defending the company’s handling of Chinese censorship probe. 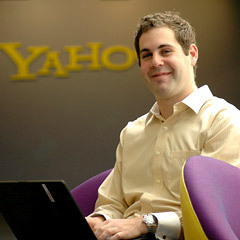 The major support, however, for the company’s falling stock price came earlier this month when Yahoo! announced to lay off hundreds of employees. The final number of people to be laid off from Yahoo’s work force of about 14,000 is yet to be determined and is likely to be announced around the end of the month, perhaps during Yahoo’s January 29 conference call with analysts after it reports fourth-quarter financial results, but it for sure had influenced the stock performance of its smaller Chinese brother Alibaba. Over the weekend, some blogs reported that Yahoo was considering layoffs of 10 percent to 20 percent of its work force. But the people close to the company, who discussed Yahoo’s layoff plans on condition that they are yet to be identified, said the cuts would likely be in the “hundreds.” Yahoo’s stock itself declined 20 percent in the last quarter. Alibaba’s today stock price is 20.20HKD fallen down from 40.50HKD as what the price was in its best days. The company’s market capitalization is close to $13B (US Dollars), which is a major decline from what the company’s highest value was – close to $26B. So, let’s now take a look at how the things look like for the US Internet giant today. Logically Yahoo!’s interest total market value in Alibaba.com is now close to $3,5B falling down from the previous $7B mark. A couple of months ago Alibaba’s value was about 16.7% of Yahoo’s then $42 billion valuation. Today Yahoo!’s market capitalization is $27.77B, which makes Alibaba’s today value close to 50% of Yahoo!’s market value. The big question here is whether Alibaba.com is overvalued or Yahoo! is undervalued? One should take into serious consideration the fact that Yahoo! is making more than $6B in revenues per year while Alibaba.com is having, as far as we know, no more than $150M in annual revenues. A quick online research revelead that Alibaba had GAAP Revenue of around $46.3M for 2004 while the company’s revenue in the first half of 2006 was about $100 million (presumingly $200M for the entire 2006). For the first 6 months of 2007 Alibaba had revenue of RMB957.7M (~$132MM) (presuming $260M for the entire 2007). The numbers show big difference, no? All calculations are made on the 1 HKD = 0.128087 USD and 1 CNY (RMB) = 0.138941 USD basis respectively. Alibaba.com (HKSE:1688), a member of the Alibaba Group of companies, is one of the world’s premier e-commerce brands and the number one online marketplace for global and domestic China trade. We provide an efficient, trusted platform connecting small and medium-sized buyers and suppliers from around the world. Our international marketplace (www.alibaba.com) focuses on global importers and exporters and our China marketplace (www.alibaba.com.cn) focuses on suppliers and buyers trading domestically in China. Together our marketplaces form a community of more than 24 million registered users from over 200 countries and regions. Our operational headquarters is based in Hangzhou in eastern China. We have field sales and marketing offices in more than 30 cities in China, Hong Kong, Switzerland and the United States. The company had more than 4,400 full-time employees as of June 30, 2007. Jack Ma, our lead founder and chairman, and 18 other founders launched Alibaba.com in his Hangzhou apartment in 1999. Originally, Alibaba.com operated as a bulletin board service for businesses to post buy and sell trade leads, and later became a vibrant marketplace for small and medium enterprises around the world to identify potential trading partners and interact with each other to conduct business online. Alibaba.com listed on the Hong Kong Stock Exchange on November 6, 2007 and is the flagship business of the Alibaba Group. October 2000 Gold Supplier membership launched to serve China exporters. August 2001 International TrustPass membership launched to serve exporters outside of China. March 2002 China TrustPass membership launched to serve SMEs engaging in domestic China trade. July 2002 Keyword services launched on our international marketplace. November 2003 TradeManager instant messaging software launched to enable users to communicate in real time on our marketplaces. March 2005 Keyword bidding launched on our China marketplace. April 2007 Gold Supplier membership launched to serve Hong Kong exporters. November 2007 Alibaba.com listed on the Main Board of the Stock Exchange of Hong Kong Limited, under stock code 1688. Below is what the Alibaba’s CEO David Wei stated at the time of their IPO. We have just celebrated our successful listing on the Main Board of The Stock Exchange of Hong Kong Limited and I’d like to welcome all our new investors and many thanks for your visionary investing commitment. Alibaba.com’s mission is to make it easy to do business anywhere. Over the years, we focused on Small and Medium-sized Enterprises (“SMEs”) sector, which have been the key driving forces for China’s economic growth and playing an increasingly important role in China’s economy. Through our world’s leading B2B e-Commerce marketplaces, we have made it possible for SMEs to grow their business and reach out to the world. We will maintain such long term focus by providing the best user and customer experience. We take our responsibility to our shareholders very seriously. We adhere to the highest levels of ethical practices and create optimal corporate governance. Our Board of Directors include a number of experienced and high caliber independent directors who chair and run our board committees. Going public is another a milestone in Alibaba.com’s history. Our belief of being a public company is to create growing sustainable value for customers and shareholders. I look forward to the ongoing support of our shareholders as we continue to build the world’s number one online marketplace for international and China trade.